The Gorean Shores tavern is located in the heart of Port Kar, not far from the great piazza which fronts the great hall where the Council of Captains meet in session. 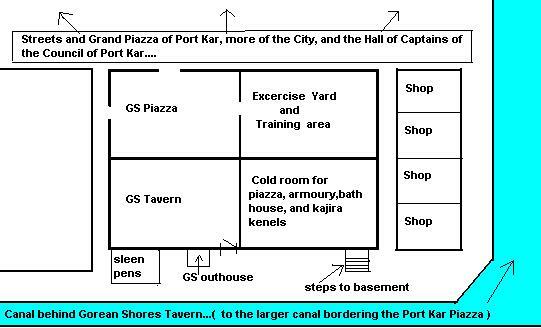 Its close proximity to the arsenal and main wharves of the city make it a convenient location for the seamen of Port Kar who return either from their work in the arsenal or from their voyages. As you walk down the narrow, cobbled street and stop before the Tavern, you are afforded the view of one of the minor canals, only wide enough for a light class ship or longboat, which runs along the street and later intersects with one of the grand canals of the City. Turning to face the nondescript two-story stone building which houses the Tavern, you notice only two rectangular windows of darkened glass, and a heavy wooden door painted in the deep green of the pirate tarnships. A small sign, plain yet crafted by the hand of a skilled builder, above the door reads "Gorean Shores" and below that in smaller script "Paga and Dancing Slaves". Stepping through the great door, you see an almost square room, forged by the hands of slaves driven by those of the builder caste. For a few brief moments, your eyes discern little of the dimly lit Tavern, save for the torches along the walls, a fire pit opposite the door on the far wall, and several small flickering tharlarion oil lamps on some of the tables. The large room's almost foreboding feeling gives you pause. Briefly you hold back, taking the few ihn needed to adjust to the obscure light, perhaps not knowing it is an intentional, yet clever design of the Tavern rulers to allow those within to gain recognition of strangers who enter before they can see the patrons. Perhaps it is a precaution against furtive assassins who might otherwise attempt to practice their skills within the tavern. Two steps of seamless stone lead down from the door to the main floor of the Tavern. By being slightly lower on the ground floor, the ceiling of the main room is higher than normal, dwarfing even the mightiest of Men. Beamed with wood for support, and black with the soot from the torches and lamps, it only adds to the almost overpowering sense that this is indeed ... Port Kar. Immediately to the right of the door landing are the serving furs, where the slaves of Gorean Shores and other slaves kneel, greeting patrons and offering their services to them. The left half of the room is divided into two sections. The section closer to the front of the room contains low round tables, with furs strewn about them. These tables are for use by the patrons, and most of the tables are large enough to fit at least eight men to a table. The other half of the left side of the tavern is slightly raised, like a dais, and contains four higher tables and the Senior Captain's table in the middle, each with curule chairs at the tables. These are the Captains' tables, reserved for the Captains of Gorean Shores. 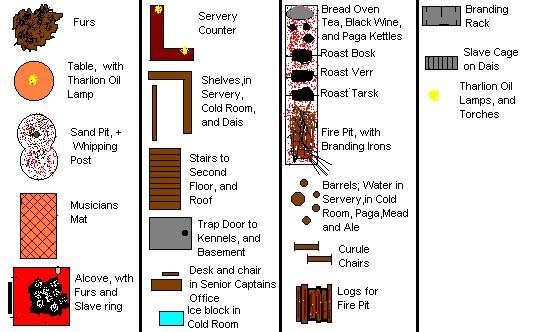 Behind the Captains' tables, along the far left corner of the room, are several doors, one leading to the Senior Captain's office, another to a staircase to the second floor, and a third to a rear entrance, which remains barred on this side. Along the rear wall of the tavern are several racks bolted into the wall which contain various slave instruments such as chains, bracelets, brands, whips, etc... In the center of the rear wall is a fire pit, a stack of logs, driftwood as well as cut logs, next to it. The stone hearth of the fire pit continues to the right side of the wall. Next to the fire pit, near the other racks, is a branding rack, for the use of the Captains and patrons. The right half of the tavern is also divided into two sections. The front section, containing the serving furs, has a number of raised alcoves in the wall, accessible by small wooden ladders. Each alcove has a red silk curtain which may be pulled closed for additional privacy. Inside the small alcoves are pleasure furs, thick and luxurious, as well as rep-clothes, and small pieces of pleasure silk. At the end of the each alcove, embedded in the stone wall, is a steel ring, with a length of thin chain attached which may be adjusted in length by a small iron lock attached to the ring. The proximity of the serving furs to the alcoves provides convenience to those sailors of Port Kar freshly returned from long voyages, that they need not drag the slaves far. The rear section of the right half of the room is dedicated to the kitchen. A chest high wooden counter, almost a bar, separates the kitchen from the rest of the room. On the rear wall of tavern, at the other end of the stone hearth, is the cooking pit, large enough for large hunks of bosk and tarsk meat to roast above the flames. A heavy iron vessel, containing paga, rests on the pit near the flames. There is a small cooking hearth as well, used for the baking of breads and melting of cheeses. The right rear wall of the kitchen has shelves and cupboard, and a small door which leads to the cool room, where certain foods and drinks are stored, principally kalana. Near the kitchen is also a woven rence mat, where musicians might play or entertainers perform. 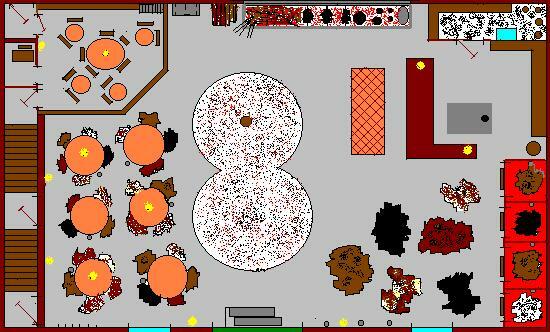 In the center of the tavern, recessed a foot or so into the floor, is a large sand pit in the shape of a figure "8". The half of the "8" nearest the fire pit in the rear wall contains a tall wooden whipping post. The other half of the "8" nearest the entrance to the tavern is empty, so that men may fight in the pit without obstructions, or slaves may dance without the support of the post. The sand is cream coloured, flecked with tiny red and black chips of stone. The second floor, accessible only by passing through the Captains' tables, is not open to general patrons, but contains living quarters for the Captains and guest quarters for certain preferred or honoured guests. It is also rumoured to have a large vault as well, where the loot of pirates and raiders may be stored, but none have provided confirmation of such rumours. The stairwell continues to the roof of the building which provides a partially obstructed view of Thassa in the distance, which has in the past been used to give wounded combatants in the sand pit the Death of Blood and the Sea. There is a narrow hallway that connects the slave kennels to the tavern. The kennels, approximately five feet long, are made of meshed wire, and contain small mats of woven rence for the slaves to sleep. Each has a small lock on the front gate of the kennel which may be secured as well. Outside of the kennels are small tables which contain cosmetics, perfumes, silks and other accoutrements for the dancing slaves of Port Kar. The Piazza Located next to a set of doors leading from the great tavern to the Piazza, where one will find it is partly covered by a large canopy. The access to the training yard, streets and markets lead from the Piazza. There are ample furs strewn about for patrons to relax, with some tables next to several sets of furs. These are nearest the walls of the tavern so patrons are afforded the views of the canals and of any danger which may come from that area. The slave mats are near the entry to the kitchen, and near the cool room doors. A set of three cages are at the far right and near the tavern doors, where slaves cant be contained. A firepit is centrally located with kettles over the pits the same as that of the tavern. The open air provides enough lighting for all to see everything surrounding them. The piazza is a safe haven for all and where the Free Women can be located. A fountain trickles near the entrance. This is a no kill / no capture area. The Forum Room Is a new addition and located near the tavern. It has a dias with a table in front of several curule chairs for the Captains. The dias is raised so they may view their audience, much like a theatre. Several furs lay strewn about for patrons and free to relax on, and several slave furs. The Forum room is more relaxed and where those interested in Gorean ideals may freely discuss these ideals including slaves who must remain respectful, but their view are considered as valuable as a free. The Forum Room is a no kill / no capture area. Market Place Located outside the tavern where merchants have shops and stalls where they can ply their trade and goods. There is a general hustle and bustle of Free Women looking at the various products required for their household, and slaves hurrying around gathering produce for their owners. The market is a no kill no capture area. Bath House Located off the tavern and strictly for free men only to bathe and relax in after a raid as an example, or just to relax and enjoy the ministrations of a slave. The bathes are supplied with luxurious towels and exotic perfumes, massage oils and other implements used to clean off the dirt and grime of patrons. A Free Woman who enters the bath house may well find herself leaving with a collar adorning her neck. A kill / capture area. The kennels For slaves only! These are where training classes are held, in an area where there are some furs set aside for classes only. The remainder of the kennels are dark and dank place where slaves are kept and is their sleeping area set aside. The kennels are a safe place for slaves to escape to in the case of any raids. Slaves can also apply their cosmetics and scents in the kennels. Only Gorean Shores Captains can enter the kennels. Any other person can enter if they have permission from the Captains such as a healer or physician. The kennels are not a kill / capture area.